amazing picturesque buildings and streets…the lights are equally stunning……a must see attraction in kl. If you want to know more about the past of Kuala Lumpur and discover how a sleepy little mining town transformed itself into a GLOBAL CITY! I went there early in the morning, when it was not too hot. It’s 5 minute-walk away from Masjid Jamek LRT station. Walk past the station is the Jamek Mosque (Masjid Jamek), one of the oldest mosques in the city. After taking some photos, I continue walking and across the Gombak River stands the the Sultan Abdul Samad Building. It reminds me of Manila City Hall, but I have to say, it’s more beautiful. I went straight to KL City Gallery after seeing the huge ‘I love KL’ sign from afar. I was lucky, there was no queue, a great photo opportunity! Usually, there’s so many tourist to have a picture with it. Getting inside the Gallery is FREE, it’s fully air-conditioned, a very nice place to escape from the Malaysian heat. The biggest highlight inside is the Kuala Lumpur City Model, Don’t miss to see the miniature KL transform into day and night with a light and sound presentation. Just a few meters away from the gallery is the tallest flagpole in Malaysia, that once became the world’s tallest, from there is a beautiful view of KL Skyline, you can also see KL Tower and Petronas Twin Towers from a far. Merdaka Square is the old center of KL. Now, the twin towers are the icons of the city. But in the past, this was ground zero for all things government. And thankfully, many of the old buildings have been preserved. Well worth a visit for a nice walk and great photo opps. Take a great walking tour from the KL City Gallery just off the square on Monday, Wednesday and Saturday morning at 9a. Go inside some of these historic buildings. Delightfully Beautiful, spacious and clean square in the middle of a very congested and dusty city center, surrounded by majestic and historic mosque, colonial building with flag masts. Very impressive. 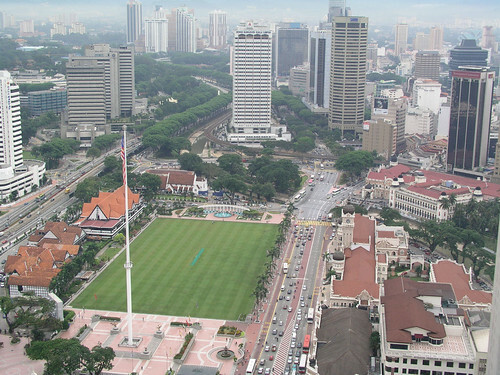 Literally Independence Square, it was formerly known as the Selangor Club Padang or simply the “Padang” and was originally the cricket green of the Selangor Club (now Royal Selangor Club). It is 17th stop on Hop-On Hop-Off bus. The bus stops here for around 10 minutes. A 95-metre flagpole, one of the tallest in the world, is the key point. It is located at the southern end of the square. Some big photos of leaders is there. On August 31, 2007, Prime Minister Abdullah Ahmad Badawi shouted ‘Merdeka!’ on midnight celebrations, where thousands of Malaysians celebrated 50 years of nationhood. Surrounding the square are many buildings of historical interest. Just beside the square is the Sultan Abdul Samad Building currently the office of the Ministry of Information, Communication and Culture of Malaysia. Opposite the square is the famous Royal Selangor Club Complex built in 1884 as a meeting place for high-ranking members of the British colonial society. To the South is the former National History Museum. To the North is the St. Mary’s Anglican Cathedral. The Merdeka Square is also known as the Dataran Merdeka or Independence Square. It’s a vast rectangular grassy field that once hosted cricket matches and parades. There are a couple of popular buildings surrounding the Merdeka Square which you can visit on foot. Buildings such as the Royal Selangor Club, the National Museum, Saint Mary’s Cathedral and the Sultan Abdul Samad Building are some of the places that you must not miss and they are located within walking distance with each other. The Merdeka Square is the place where you could find many of the great history events took place in Kuala Lumpur. National event such as the lowering of the Union Flag was performed here on August 31st, 1957 when independent Malaysia was born. Today the Malaysian flag flies at the southern end of the square. It was here that the Malaysian flag was raised for the very first time at 12.01 on 31st August 1957 to replace the Union Jack, thus signifying the end of British rule over Malaya and the end of colonization. It is also here that Malaysians regardless of race and belief, throng in the thousands, on the eve of 31st August every year to usher in yet another year of independence. The Merdeka Square is also the venue of many Independence Day celebrations and parades. The 95-meter flagpole at the end of the square is among the tallest in the world. The Merdeka Square, previously known as the Selangor Club Padang, was built by the British in 1884 during their colonization of Malaya. The strategic site and exclusive location resembled the atmosphere and environment of their homeland. The field was once a popular venue for social activities and occasionally used for the game of cricket. At the corner of the square stands a fountain that was built in 1897. Surrounding the square are many buildings of historical interest. Just beside the square is the Sultan Abdul Samad Building currently the office of the Ministry of Information, Communication and Culture of Malaysia. Opposite the square is the famous Royal Selangor Club Complex built in 1884 as a meeting place for high-ranking members of the British colonial society. To the South is the former National History Museum which used to house a vast collection of historical items. The collection has recently been moved to Muzium Negara. To the North is the St. Mary’s Anglican Cathedral, currently the Diocese of West Malaysia and the see of the Bishop of West Malaysia. You can spend up to a day in exploring these buildings alone. Therefore, do allocate at least a day for Merdeka Square when you are touring Kuala Lumpur. The following are some of the famous places in the Merdeka Square which you are recommended to visit. This building was built in the English Gothic style b y A.C Norman. It’s home to an exceptional English pipe organ installed in 1895. Regarded as the country’s most prestigious private club, the Royal Selangor Club is also known as The Spotted Dog and it’s once the focus of colonial life in Kuala Lumpur. This building is one of the most photographed buildings in Malaysia due to its unique Moorish-style architecture which dates back to 1897. The building dominate the eastern side of Merdeka Square and it now houses a division of the Malaysian High Court. It’s a must-see place which you must not miss in your KL travel itinerary. Masjid Jamek is also known as the Friday Mosque. The mosque was rich in history as it was build in 1909 and it’s one of the oldest surviving mosques in Kuala Lumpur. The central market was once the city’s main fresh produce market. But it’s now a one stop center where the Indian, Chinese and Malay ethnic art and craft shops are housed. It was once home o the Chartered Bank of India, Australia and China. But now this 19th century building had been converted into a museum. Some of the attractions here are a seven-armed Buddha, coral-encrusted porcelain and coins in animal shapes.